This article is about Sonic's appearance in Super Smash Bros. 4. For the character in other contexts, see Sonic the Hedgehog. Sonic (ソニック, Sonic) is a playable character in Super Smash Bros. 4. His return to the series was announced on October 1st, 2013 during a Nintendo Direct. Sonic is one of the six third-party characters in the game, alongside fellow Sega representative Bayonetta; Capcom's Mega Man and Ryu; Bandai Namco's Pac-Man; and Square Enix's Cloud. He was the second third-party character to be revealed in the game, and is the first third-party veteran in the series. In the English version, Sonic is now voiced by Roger Craig Smith, albeit via recycled voice clips from games such as Sonic Generations and Mario & Sonic at the London 2012 Olympic Games.This reflects Smith's succession of Jason Griffith as Sonic's voice actor, who voiced Sonic from 2005 until 2010. Sonic also has alternate voices for the French, Spanish, German, and Italian versions, as Sonic the Hedgehog games from Sonic Generations onward were dubbed into those languages, all respectively voiced by Alexandre Gillet, Jonathan López, Marc Stachel and Renato Novera. However, the Japanese version simply recycled Junichi Kanemaru's voice clips from Super Smash Bros. Brawl, who has been his Japanese voice actor since Sonic Adventure. Sonic is currently ranked 7th out of 55 on the tier list, placing him in the A tier and tying him with Fox. This is a significant improvement over his mid-tier placement in Brawl, where he was ranked 22nd out of 38. Sonic unsurprisingly boasts the fastest dashing speed in the game; when coupled with his special moves allowing him to attack while in motion with little fear of reprisal, Sonic's approach and neutral game are both impressive. The majority of Sonic's moveset also has improved utility, most notably in regard to his KO potential. However, Sonic's KOing options are hindered by their high lag, which makes them risky and impairs his ability to KO outside of the neutral game. Despite his mobility, the linearity of Sonic's recovery makes him susceptible to gimping. By extension, he has trouble contending with projectile camping, owing to both his lack of a reliable projectile and an effective way to stop them. Thanks to his newfound and retained strengths outweighing his flaws, Sonic has attained a large playerbase that consistently achieves strong results in tournaments. Sonic is a middleweight that, like in his home series, possesses outstanding mobility. He fittingly boasts the fastest dashing speed in the game, yet also possesses the seventh fastest walking speed and ninth fastest air speed, the latter of which is tied with Mario and Donkey Kong's. 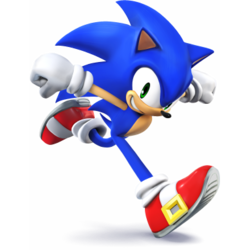 When coupled with his below-average falling speed and above-average gravity, Sonic has nigh-omnipresence; even in spite of his very slow air acceleration, his other attributes enable him to travel at a blinding speed across any stage. These traits, in turn, make Sonic able to easily and effectively utilize a hit-and-run playstyle. To round out his outstanding mobility, Sonic is capable of wall jumping. Sonic possesses very useful special moves. Spin Dash and Spin Charge are perhaps Sonic's best neutral game options, as they allow him to roll across the stage at varying speeds while also dealing damage upon contact. Spin Dash allows Sonic to jump even while charging, and can be canceled with a grab or by shielding, which grants it mindgame potential. Spin Charge, however, hits multiple times and moves even faster, making it a reliable alternative to dashing. Both, however, can give Sonic additional protection when recovering and even chain into other attacks. When coupled with their extremely similar animations, opponents have to tread carefully when dealing with these moves, since a single misstep can result in a very fast chain of attacks that can deal impressive damage. Homing Attack deals a varying amount of damage, but homes in on the nearest opponent, making it useful for punishing laggy attacks and edge-guard breaking. Spring Jump is a useful recovery move that grants intangibility during start-up and covers an impressive amount of vertical distance. It is also one of the few recovery moves that does not cause helplessness, as Sonic is able to attack and dodge during his descent, while the spring that is dropped can be useful both on-stage and off-stage by allowing him to pressure and gimp opponents, respectively. Sonic also has a strong air game. Neutral aerial is a great combo starter when SHFF'd, thanks to its long-lasting hitbox, fairly low landing lag, and launching angle. Forward aerial is useful for edge-guarding and, in certain instances, can combo into itself on-stage at low percentages, thanks to its auto-canceling window and Sonic's fast air speed. Up aerial possesses KO potential near the upper blast line and is great for combos, while its auto-canceling window makes it deceptively safe. Back aerial's clean hitbox is powerful, making it one of his few reliable KOing options like his up aerial. Lastly, down aerial is a stall-then-fall; although it is Sonic's least effective aerial, it has noticeably less ending lag compared to other stall-then-falls, and its clean hitbox meteor smashes aerial opponents. Sonic's neutral attack, tilt attacks, and throws have decent damage outputs and minimal lag, which make them hard to punish. Incidentally, his grab game is decent overall. While none of his grabs excel in speed and each of them have average ranges, they are still fairly easy to land thanks to his mobility. Sonic's pummel is quick and has an average damage output, which allows him to rack up a fair amount of damage before throwing an opponent. Down throw is a semi-spike that has high base knockback, which make it excellent for setting up edge-guards and tech-chases. Back throw also possesses high base knockback, but KOs much earlier than his other throws, especially if it is used while near the edge. It also moves Sonic backward, which makes it useful for setting up an immediate edge-guard attempt. Up throw is a fairly reliable combo starter: while its combo potential is not as consistent as Spin Dash and Spin Charge's, it still possesses decently damaging combos beginning at 0%, as well as Spring Jump-assisted aerial combos beginning at medium percentages. It also has KO potential, although it only KOs reliably at very high percentages when used on high platforms, such as Battlefield's top platform. Lastly, forward throw is his least useful throw, as its primary utility is for forcing the opponent into the air. Like up throw, it can also function as a KOing option, albeit only when used on high platforms at very high percentages. However, Sonic has some weaknesses, the most noticeable of which is his KO potential. Despite having improved considerably since Brawl, his KO potential is held back by his most reliable KOing options (forward/up smashes, clean back aerial, and up aerial) requiring good positioning and, aside from up aerial, having noticeable start-up and ending lag. His forward and up smashes are also burdened with low base knockback, which forces them to be used for KO attempts later instead of earlier. Despite his outstanding mobility, Sonic also has trouble landing without the use of Homing Attack or Spring Jump, owing to his forward, back, up and down aerials have at least 21 frames of landing lag. This is further exacerbated by his very slow air acceleration leaving him susceptible to juggling. Sonic can also have difficulty dealing with camping, since any ground-level projectile can severely limit his movement options. Lastly, Sonic can be susceptible to early KOs. Unlike other middleweights, such as Mario and Luigi, some of his attacks are very punishable should they miss, and thus allow openings for opponents to punish him. His recovery is also predictable if Spring Jump is his only recovery option, as its linearity makes him susceptible to gimps even at relatively low percentages. Sonic has many beneficial custom moves at his disposal. Stomp can meteor smash opponents, making it more useful for edge-guarding. Hammer Spin Dash can bury opponents during start-up, allowing for follow-ups that Spin Dash would not permit. In comparison, Burning Spin Dash deals much more damage and its lower jumps leave Sonic less vulnerable after landing a hit. Auto-Spin Charge removes the need for button mashing in order to charge and has a deceptive charging animation that does not reveal when the move starts losing power, the latter of which makes it suitable for mindgames. Lastly, Gravitational Charge has a wind effect that pulls opponents in front of Sonic toward him, making it easier for him to hit them. However, it also pushes away opponents behind him, which can make it more difficult for them to punish him directly. Overall, Sonic is a character with incredible offensive prowess that must force opponents to make a mistake in order to safely rack up damage and use his excellent mobility to avoid heavy punishment. Despite receiving nerfs from game updates, Sonic remains a strong choice for competitive play, with professionals such as KEN, 6WX, and komorikiri consistently achieving great results with him. Sonic has received a mix of buffs and nerfs in the transition from Brawl to SSB4. Due to the former significantly outweighing the latter, Sonic was overall buffed. The most noticeable improvement has been to his KO potential, which was his most glaring weakness in Brawl. A number of Sonic's attacks have had their knockback increased; most notably, forward/up smashes and clean back aerial are now much more viable KOing options, while back throw now possesses KO potential. Sonic's moveset, in general, has also been improved to varying degrees. Notably, two of his moves (dash attack and down smash) have been completely overhauled. Sonic's new dash attack hits multiple times, which is further supplemented by the weakening of SDI, and possesses very high knockback growth; altogether, these traits make it better than his previous dash attack in regard to punishing and tech-chasing. In comparison, Sonic's new down smash is generally more useful than his previous one, thanks to it being a semi-spike that has a consistent damage output and much less overall lag. Outside of these two instances, some of Sonic's moves benefit from both direct changes and modifications to gameplay mechanics. Neutral aerial and up throw's angles have been altered, although the latter move also deals less damage and has compensated knockback which hinders its damage racking potential and does not grant it significantly greater combo potential which it otherwise would have if its knockback were unchanged. When coupled with the changes to hitstun canceling, they, alongside Spin Charge, now possess improved combo potentials. Due to its angle being altered, down aerial's clean hitbox now meteor smashes aerial opponents; when coupled with the removal of meteor canceling, clean down aerial is now a much more potent edge-guarding option. Lastly, up smash and forward aerial are much more reliable at trapping opponents, due to the aforementioned weakening of SDI. However, Sonic also received some nerfs mainly to his speed both in terms of mobility and frame data. A number of his moves have become laggier to varying degrees. A good example of this is his back aerial which has drastically increased landing lag and a worse auto-cancel window which significantly harms its utility despite its increased power. Some moves (such as his forward/down smashes and up/down aerials) also have shorter durations. Despite his overall higher KO potential, some moves have reduced KO potential such as up aerial and down smash and his overall damage output is lower reducing his damage racking capabilities (although this is the case for most returning veterans). Sonic's mobility has also taken a hit relative to the cast although this is mainly due to the changes to Smash 4's mechanics combined with the general increase other characters received to their mobility. While Sonic still has the fastest dashing speed by a huge margin, it is nevertheless lower relative to the cast as he was one of the few characters whose dash speed was not increased. His walking speed was also decreased. The removal of DACUS hinders up smash's versatility as it hinders up smash's approach potential and to make matters worse, his running up smash covers significantly less distance. The removal of glide tossing also hinders his approach with items. Although remaining very respectable, Sonic's recovery has nevertheless worsened in two particular ways: Spring Jump now covers less vertical distance, its intangibility has increased startup lag and Sonic cannot act as soon out of it not only making it a worse recovery option but also making it a less effective combo breaker. Homing Attack can no longer be used repeatedly without landing on the ground again removing Sonic's ability to infinitely stall with it. Lastly, Spin Dash's damage racking potential was toned down via update 1.0.6 and it can no longer be used with momentum canceling significantly hindering Sonic's endurance. 1.0.6 also notably made his back throw weaker. Ultimately, Sonic's greater KO potential makes up for his reduced speed and damage output and the changes to the game's mechanics benefit him more than they hinder him. As a result, he is a significantly better character relative to the cast and has overall seen a lot more success at high level play. Sonic's design is now based on his appearance from Sonic Unleashed and onwards. His quills are now slightly shorter and significantly less fluid; his mouth is now positioned on the side of his muzzle by default; and his irises are spread slightly further away from each other. Additionally, Sonic's fur and skin are now slightly more vibrant, and his eye color is now slightly more subdued. Lastly, his shoes now have a polished finish. Sonic has received three new alternate costumes. Spin Dash-based attacks emit a lower pitched sound effect similar to the one used in Sonic Lost World. Some attacks also have updated visual effects. Idle poses' animations have slightly changed. Sonic's expression now remains unchanged throughout their durations. Side taunt's animation has slightly changed. Sonic now grins throughout its duration, instead of grinning and then quickly assuming a stern expression. He now says "Sonic speed" instead of "You're too slow". First victory pose has slightly changed. The blue Chaos Emerald now levitates in Sonic's hand after he grabs it, instead of directly touching his hand. Sonic now faces the foreground, regardless of whether he is facing left or right. Sonic is lighter (95 → 94). When combined with the changes to hitstun canceling and momentum canceling, this significantly hinders his endurance while also making him more susceptible to combos. Sonic walks slower (1.4 → 1.375). Sonic's air speed is faster (1.1092 → 1.15). Sonic's gravity is higher (0.085 → 0.09). As with all returning veterans, Sonic's fast falling speed is faster (2.0 → 2.32). This improves his air game, and makes him less susceptible to juggling. Sonic's traction is lower (0.07 → 0.06). Air dodge (frame 49 → 31), rolls (frame 32 → 28) and spotdodge (frame 26 → 25) all have less ending lag. Air dodge also has less startup lag (frame 4 → 2). Air dodge (frames 4-29 → 2-25), rolls (frames 4-19 → 4-15) and spotdodge (frames 2-20 → 2-15) all have a shorter duration. The removal of glide tossing hinders Sonic's approach with items. Neutral attack's last hit deals 1% more damage (3% → 4%) and knockback (24 (base), 130 (scaling) → 50/110). The angles of the first two hits have been altered (361° (both) → 92°/60°/361° (hit 1), 80°/60°/48° (hit 2)) and they have increased set knockback (10 → 18). These changes allow neutral attack to connect more reliably and improve its jab canceling potential but removes the second hit's ability to lock and the first hit can only lock when used at close range making jab locking slightly harder. The third of neutral attack has more ending lag (frame 31 → 36). Forward tilt's second hit has increased base knockback (10 → 30). Up tilt deals less damage (3% (early)/4% (hit 1)/7% (hit 2) → 2% (hit 1)/6% (hit 2)) although the base knockback on the second hit was compensated (35 → 40). Its second hit also has a shorter duration (frames 18-20 → 18-19) and its early hitbox has been removed. Up tilt has decreased ending lag (frame 50 → 40). Down tilt has decreased base knockback (40/30 (base) → 30) and a shorter duration (frames 6-8 → 6-7). Sonic also does not travel as far when using down tilt hindering its range and making it less effective as a pseudo crawl. Down tilt's angle has been altered (80° (near)/70° (mid)/361° (far) → 361° (all)). This improves its locking potential, but significantly hinders its combo potential. Down tilt's is more reliable at tripping opponents due to its altered angle despite its decreased chance of tripping (40% → 20%). Sonic almost has a new dash attack, a Spin Attack followed by a flying kick. Compared to the previous dash attack, it has more knockback (70 (base), 50 (scaling) → 80/125). Unlike the previous dash attack, it hits multiple times. These differences make it more effective at punishing and tech-chasing. Dash attack has more startup (frame 4 → 5) and ending lag (frame 44 → 62) compared to the previous dash attack. It is also less reliable due to being a multi hit. Forward smash has increased knockback scaling (98 → 101), improving its KO potential. Forward smash has increased ending lag (frame 45 → 48) and a shorter duration (frames 18-21 → 18-20). Sonic now grunts when using forward smash, instead of saying "Go!" Up smash's last hit has increased knockback (70 (base), 153 (scaling) → 80/165) and launches opponents at a higher angle (75°/82°), significantly improving its KO potential. The weakening of SDI makes up smash significantly more difficult to escape from. The removal of DACUS significantly hinders up smash's approach potential. To further compound this, up smash also does not cover as much distance when performed out of a dash. Sonic has a new down smash, a split kick. Compared to the previous down smash, it deals consistent damage (12% (early)/9% (clean)/7% (mid)/5% (late) → 12% (front/back)), and has less start-up (frame 17 → 12) and ending lag (frame 58 → 55). Unlike the previous down smash, it is a semi-spike, making it significantly more effective at edge-guarding. Down smash deals less knockback (40 (base), 100 (scaling) → 55/63 (front), 50/80 (back)) compared to the previous down smash, making it significantly less effective at KOing. It also has a shorter duration (frames 17-37 → 12-13) and less range compared to the previous down smash. Clean neutral aerial deals 1% more damage (11% → 12%). Neutral aerial also has a larger hitbox and now launches opponents vertically (361° → 75°). When coupled with the changes to hitstun canceling, these changes significantly improve its combo potential. Neutral, back, and down aerials have increased landing lag (12 frames → 16 (neutral), 9 frames → 30 (back), 30 frames → 38 (down)). Forward aerial deals less damage (1%/2% (hits 1-5)/4% (hit 6) → 0.8% (hits 1-5)/3% (hit 6)), although its last hit's knockback scaling was compensated (120 → 135). It also has increased ending lag (frame 36 → 46). Forward aerial has decreased landing lag (30 frames → 26). Forward aerial now has a normal effect, instead of a slash effect. The weakening of SDI makes forward aerial significantly more difficult to escape from. Back aerial deals 1% more damage (13% (clean)/9% (late) → 14%/10%), and the late hit has increased knockback scaling although the clean hit's knockback scaling was somewhat compensated (94 (clean)/90 (late) → 90/100). Back aerial auto-cancels later (frame 29 → 33). This combined with its drastically increased landing lag makes it a much worse spacing and landing tool. Up aerial's second hit deals less knockback (63 (base)/90 (growth) → 66/82), hindering its KO potential. Up aerial's second hit also has a shorter duration (frames 14-18 → 14-15). Up aerial has decreased landing lag (22 frames → 21) and due to the second hit's shorter duration, it auto-cancels earlier (frame 19 → 16). Up aerial's animation has slightly changed. Sonic no longer twists around when performing the scissor kick. Down aerial has increased start-up lag with a shorter duration (frames 16-37 → 17-32). It also has more ending lag (frame 44 → 46) and auto-cancels later (frame 39 → 41). Due to its angle being altered (37° → 285°), clean down aerial is now a meteor smash against aerial opponents. When coupled with the removal of meteor canceling, this significantly improves its edge-guarding potential. Standing and pivot grabs have increased ending lag (frame 29 → 31 (standing), frame 35 → 37 (pivot)). Pummel deals 1% less damage (3% → 2%). Forward throw deals 2% less damage (3% → 1% (hit), 9% → 7% (total)). Forward throw has increased base knockback (60 → 100) granting it KO potential at high percentages when used on a platform. Back throw deals 1% less damage (8% → 7%). Back throw has increased knockback scaling (60 → 79) improving its KO potential in spite of its lower damage output. Up throw deals less damage (3% → 1% (hit), 9% → 5% (throw), 12% → 6% (total)), and the knockback on the throw was compensated (65 (base)/70 (scaling) → 92/80). Up throw's angle has also been altered (100° → 92°). When coupled with the changes to hitstun canceling, these changes improve its combo potential at low to medium percentages despite its higher knockback. Down throw deals 1% less damage (8% → 7%) although its knockback scaling was compensated (30 → 35). The removal of chain grabbing hinders down throw's damage racking potential. Homing Attack no longer deals consistent damage (8% → 5%-12%), and it has increased knockback scaling (80 → 90). Homing Attack has decreased start-up lag (frame 51 (non-inputted)/frame 26 (inputted) → 34/22). Aerial Homing Attack can only be used once instead of repeatedly, hindering its recovery potential. A missed Homing Attack propels Sonic farther. Spin Dash's roll and jump deal less damage (7%-10% → 6%/7% (roll), 7% → 3% (jump)), hindering its damage racking potential. Spin Dash's short hop is significantly faster. This improves its combo and mindgame potential, but hinders its recovery potential. Charged Spin Dash can now be held while jumping, improving its mindgame potential. If Sonic uses Spin Dash on a slope, he will no longer gain invincibilty while using the Spin Dash. Spring Jump covers slightly less vertical distance, but can now edge sweetspot some time after being used. Spring Jump's intangibility has more startup lag (frame 2 → 5). Spring Jump also has increased ending lag (frame 16 → 19). Grounded Spring Jump's spring remains on-stage for a shorter amount of time (240 frames → 235). Sonic can immediately reuse Spring Jump after landing on a grounded spring, slightly improving its safety. Aerial Spring Jump's spring now lingers after it hits an opponent. Spring Jump's animation has slightly changed. Sonic now scowls during the ascent, instead of grinning. The removal of the grab release glitch allows Sonic to re-use Spring Jump if he has been grabbed in midair. Sonic can no longer reuse Spring Jump if he is hit out of it with Mario's Cape. The changes to hitstun canceling improve Spin Charge's combo potential. If Sonic lands with aerial Spin Charge, he can no longer cancel it by shielding. Super Sonic deals less damage (13% (idle)/18% (ram) → 5% (idle)/6%-14% (slow to fast ram)/16% (fastest ram)) and has decreased knockback, slightly hindering its KO potential. Super Sonic's fastest ram's angle has been altered (90° → 70°). Sonic now says "Super Sonic style!" upon activating Super Sonic, instead of "Now I'll show you!" Sonic has been nerfed by game updates. Update 1.0.6 severely hindered his back throw's KO potential by noticeably decreasing its knockback growth, and toned down Spin Dash's damage racking potential by lowering the damage outputs of its rolling and jumping hitboxes. Update 1.0.4 increased forward smash's ending lag, while updates 1.0.8 and 1.1.0 decreased the knockback growth of his up smash and forward smash, respectively. However, Sonic also received somewhat noticeable buffs. Update 1.0.4 removed the grab release glitch, which enables him to re-use Spring Jump if he is grabbed in midair. Update 1.0.8 reverted down aerial's ending lag to what it was in Brawl; in addition to making it safer when used off-stage, it also made its clean hitbox more reliable for edge-guarding. Lastly, Sonic's multiple hit attacks benefit from the changes to shield mechanics brought about by updates 1.1.0 and 1.1.1. Although the nerfs to Sonic's KOing options and damage racking potential have slightly toned down his offensive presence, many professional players have shown that he is still a very viable character regardless. Forward smash's ending lag increased: frame 44 → 48. Fixed the grab release glitch. Back throw's knockback growth decreased: 90 → 79, significantly hindering its KO potential. Homing Attack now only targets characters, instead of also targeting certain projectiles, such as Trick Shot. Spin Dash's roll and jump deal less damage: 7%-10% (roll)/7% (jump) → 6%/7% (roll)/3% (jump), hindering its damage racking potential. Burning Spin Dash's invincibility removed. Spring Jump can no longer be Pocketed. Up smash's last hit's knockback growth decreased: 177 → 165, significantly hindering its KO potential. Item toss speed decreased (0.983333 → 0.98). Max walk speed while carrying heavy items decreased (1.005 → 0.995). Down aerial's ending lag decreased: frame 50 → 46, restoring its ending lag from Brawl. Forward smash's knockback growth decreased: 106 → 101, hindering its KO potential. Floor attack's shield damage increased: 1 → 10. 2% The Punch + Punch + Kick combo from Sonic the Fighters. Its first hit can be jab canceled reliably into any tilt attack, and is capable of jab locking. 6% A legsweep. It can potentially trip opponents. If used repeatedly in succession, it will slowly move Sonic forward. It resembles the Leg Throw from Sonic the Fighters. 1% (hits 1-3), 3% (hit 4) A Spin Dash followed by a flying kick. It is a reliable follow-up from a down throw. While its very minimal start-up lag can allow it to pressure unwary opponents, it is very punishable because of its considerable ending lag. It resembles the Somersault, an attack that debuted in Sonic Adventure 2. 14% The Wind-Up Punch from Sonic the Fighters. It has high knockback growth, deceptive range, and can be angled, all of which make it one of Sonic's most viable KOing options. However, its very low base knockback makes it better suited for KO attempts later instead of earlier. It also has noticeable start-up and ending lag, making it risky if used unwisely. It KOs middleweights at 102%/92% (3DS/Wii U) while near the edge of Final Destination. 5% (hit 1), 1% (hits 2-7), 3% (hit 8) A jumping Spin Dash. It hits multiple times, with its last hit having extremely high knockback growth, and grants intangibility on frames 18-20. However, its last hit has average base knockback, which makes it better suited for KO attempts later instead of earlier. Its last hit KOs aerial middleweights at 120%/110% (3DS/Wii U) from anywhere on Final Destination. 12% A split kick, similar to Fox and Falco's down smashes. It has the lowest amount of start-up lag out of Sonic's smash attacks and hits on both sides, which make it useful for punishing rolls. It is also a semi-spike, which makes it very useful for edge-guarding, especially when landing its back hit. Its back hit KOs middleweights at 122%/108% (3DS/Wii U) while near the edge of Final Destination. However, it lasts for only 1 frame, and has considerable ending lag. Its front hit also KOs later than its back hit because of its below-average base knockback and knockback growth. 14% (clean), 10% (late) A hook kick. Its clean hitbox's impressive damage output and high knockback growth make it one of Sonic's most viable KOing options, especially when used for edge-guarding. Its clean hitbox KOs middleweights at 118%/107% (3DS/Wii U) while near the edge of Final Destination. If used while descending, Sonic's descent will be slowed slightly at its start. However, it has moderate start-up and ending lag, as well as high landing lag. 3% (hit 1), 6% (hit 2) A scissor kick. Its very large auto-cancel window makes it deceptively safe and easy to avoid its fairly high landing lag. In addition to being a reliable follow-up from Spin Dash, Spin Charge, and Spring Jump-assisted combos, it is a viable KOing option near the upper blast line, especially as a follow-up from Spring Jump. Its second hit KOs middleweights at 133%/118% (3DS/Wii U) while near the upper blast line of Final Destination. 8% (clean), 7% (late) A diagonal flying kick. It is a stall-then-fall, but unlike the majority of other stall-then-falls, it is relatively safe to use off-stage thanks to it having noticeably less ending lag in comparison. Its clean hit also meteor smashes aerial opponents on frames 19-22, but not grounded opponents. It resembles the Stomp Dive from Sonic the Fighters and the Sonic Rocket from Sonic Battle. — Clinches the opponent. Sonic's standing grab is the thirteenth shortest ranged in the game. However, thanks to his pivot being tied with Fox, Greninja, and Meta Knight's for the third longest in the game, his pivot grab is useful. 1% (hit 1), 6% (throw) A stretch kick. Due to its average damage output, very high base knockback, and average knockback growth, it is mainly used to force the opponent off-stage. It also has KO potential, albeit only on with stages with highly elevated platforms, such as Battlefield's top platform. It resembles the Top Kick from Sonic Battle. 7% Quickly backflips repeatedly with the opponent in tow before performing the tomoe nage, a Judo throw. It is Sonic's only throw with consistent KO potential and, prior to update 1.0.6, was one of the strongest back throws in the game. As of update 1.0.6, it KOs middleweights at 173%/165% (3DS/Wii U) while near the edge of Final Destination. 1% (hits 1-3), 4% (throw) Pins the opponent to the ground and then Spin Dashes onto them. Due to being a semi-spike, it is reliable for tech-chasing and setting up edge-guards. It resembles the Double Spin from Sonic the Fighters. 6% Spin Dashes around in a circular motion while getting up. 7% Spin Dashes forward while climbing up. It resembles the Cliffhanger Flip from Sonic the Hedgehog Spinball. Default Homing Attack 5%-12% Curls up into a ball while briefly ascending, homes onto the nearest opponent, and then rams into them. Pressing the special button will execute the move earlier. Custom 1 Stomp 5% Instead of homing onto an opponent, Sonic plummets straight down. It deals consistent damage and meteor smashes opponents. It resembles the attack of the same name that debuted in Sonic Unleashed. Custom 2 Surprise Attack 8% A faster variation that deals consistent damage. If it does not home onto an opponent, Sonic will launch himself upward instead of downward, which can enable it to be used for recovering. However, is has less knockback, more ending lag, and shorter range. Default Spin Dash 6%/7% (dash), 5% (initial jump), 3% (jump) Curls up into a ball, performs a short hop, and then starts rolling toward the opponent at a fast speed. Holding the special button charges it up and increases its speed. In addition to granting intangibility on frames 1-6, it boasts impressive combo and mindgame potential, thanks to its ability to be followed up with any aerial attack, and its ability to be canceled via shielding, respectively. It also boasts horizontal recovery potential when it is jump-canceled immediately upon releasing the special button; this turns the dash into a "Spin Shot", a quick, long-ranged short hop that can be performed either on the ground or in the air. Custom 1 Hammer Spin Dash 7% (hit 1), 5% (hit 2), 3% (late) The short hop at the beginning is higher, and the descent of the hop's arc is capable of burying opponents. However, it has a late hitbox that deals less damage. Custom 2 Burning Spin Dash 12% (hit 1), 7% (hit 2) Deals more damage and has a flame effect, but lacks a short hop and any jumps out of the move are considerably lower. It resembles the Fire Somersault from Sonic Adventure 2. Default Spring Jump — (jump), 4% (spring) Pulls out a spring and uses it to springboard into the air. Although it is primarily used for recovering, it is also useful for partaking in combos. It grants intangibility on frames 5-13, while the spring itself can also be used to gimp recovering opponents underneath Sonic. Custom 1 Double Spring 2% (per spring) Sonic can pull out two springs, but each spring deals less damage and the move covers much less distance overall. Custom 2 Springing Headbutt 3% (grounded hit), 1% (early aerial hit), 7% (late aerial hit) Headbutts opponents while ascending. It deals the most damage if Sonic hits the opponent at its ending instead of at its beginning. However, it covers slightly less distance, and the spring does not remain on-stage. Default Spin Charge 2% (per hit) A Spin Dash that hits multiple times and has more momentum. It also has slightly different aesthetics, requires button mashing in order to charge, and can become a "Spin Shot" like Spin Dash. However, it lacks a short hop at the beginning, cannot be canceled in any way, and it can only become a "Spin Shot" when used in the air. Custom 1 Auto-Spin Charge 2% (per hit) Functions like Spin Dash by lacking the need to button mash in order to charge. It also has altered aesthetics, which make it more deceptive than Spin Charge, and thus better at mindgames. Custom 2 Gravitational Charge 2% (per hit) Pulls opponents in front of Sonic toward him, and pushes opponents behind Sonic away from him. Super Sonic 18% (Chaos Emeralds), 5% (idle), 6%-8% (slow ram), 9%-11% (moderate ram), 12%-14%, (fast ram), 16% (fastest ram) Gathers the Chaos Emeralds and uses them to attain his Super Transformation from the Sonic the Hedgehog games. When activated while very close to an opponent, the Chaos Emeralds will damage the opponent. Upon being activated, Sonic is invincible during its duration, and can fly in any chosen direction, depending on where the control stick/circle pad is tilted. The longer the control stick is held in a certain direction, the faster and more damaging his ramming attack will be. Spin Dashes onto the stage from the foreground and strikes a pose. The Mission Clear jingle from Sonic the Hedgehog (2006), which is an orchestrated remix of the Act Clear jingle from Sonic the Hedgehog 3, entitled Mission Clear. Performs the pike, a breakdancing move, and then strikes a pose while saying "Let's do that again sometime!" In Japanese, he says "Hey guys! また遊んでやるぜ!" (Hey guys! I'll play again next time!) It resembles his victory animation upon achieving an S-Rank in the Xbox 360 and PlayStation 3 versions of Sonic Unleashed, as well as Blaze the Cat's victory animation when she clears a mission in Sonic The Hedgehog (2006). 6WX - One of the best Sonic players in the world. Placed 4th at Apex 2015. Ranked 43rd on the Panda Global Rankings. aperture - Placed 7th at B.E.A.S.T 7; 25th at 2GGC: Nairo Saga; and 17th at 2GGC: West Side Saga. He has wins over ANTi and Tweek. Craftis - Placed 7th at Shine 2016. He has wins over ANTi, Marss, Light, Mr.E, and Pugwest. Goof - One of the best Sonic players in the Midwest. Ranked 12th on the Michigan Power Rankings. She has wins over Ally, Ryuga, Blacktwins, and Ryo. Ixis - The best Sonic player in the United Kingdom. Ranked 1st on the United Kingdom Power Rankings. JaKaL - One of the best Sonic players in the United States. Placed 5th at Shine 2018, ranked 3rd on the New Jersey Power Rankings and has wins over MkLeo, ANTi, Marss, VoiD, James, and Mr.E. KEN - The best Sonic player in the world. Placed 2nd at 2GGC: MkLeo Saga and 5th at EVO 2017. Ranked 2nd on the JAPAN Power Rankings and 9th on the Panda Global Rankings 100. K.I.D.Goggles - Placed 9th Pound 2016. He has wins over Mr.E, Vinnie, and False. komorikiri - One of the best Sonic players in the world. Ranked 16th on the Panda Global Rankings and 6th on the JAPAN Power Rankings. Kuma - The best Sonic in New England. Ranked 5th on the New England Power Rankings, and 1st on the New Hampshire Power Rankings. Manny - One of the best Sonic players in the world. Placed 9th at both EVO 2015 and CEO 2015. Ranked 23rd on the Panda Global Rankings. He has wins over Dabuz, ANTi, and Zinoto. Peli - One of the best Sonic players in the United Kingdom. Placed 33rd at GENESIS 5. Ranked 6th on the United Kingdom Power Rankings. Has wins over Fatality, Locus, and TLTC. Phoenix - Placed 13th at 2GGT: Abadango Saga and 25th at 2GGC: ARMS Saga. Ranked 13th on the SoCal Smash Rankings. He has taken sets off of Elegant, AC, and K9sbruce. Seagull Joe - The third player to take a set off of ZeRo in 2015 upon defeating him at The Big House 5. Sonido - Ranked 3rd on the Georgia Power Rankings. He has wins over Mew2King, Fatality, Zinoto, and CaptainZack. Sonix - The best Sonic player in the Dominican Republic. SuperGirlKels - The best female Smash player and Sonic player in Canada. Placed 5th at Royal Flush and Canada Cup 2018. Ranked 1st on the Montreal Power Rankings. Wonf - The best Sonic player in Mexico. Ranked 6th on the Mexican Power Rankings. Wrath - One of the best Sonic players in the world. Currently ranked 29th on the Panda Global Rankings. He has wins over Salem, Ally, Fatality, and ScAtt. VaLoR - The best Sonic player in the Southwest. Placed 13th at 2GGC: West Side Saga. Ranked 2nd on the Utah Power Rankings. He has a win over Tyroy. Blue - One of the best Sonic players in the United States before switching to Mewtwo and Charizard. Mew2King - Placed 4th at The Come Up and 2nd at KTAR XI. He has wins over 6WX and Meekspeedy. Sonic was initially perceived as a high-tier character, thanks to his buffs largely mitigating most of the weaknesses he had in Brawl. While his newfound KOing options would be nerfed in game updates, Sonic's playerbase has nevertheless managed to display many different and effective playstyles. In addition to enriching Sonic's metagame, the likes of 6WX, KEN, Komorikiri, Seagull Joe, and SuperGirlKels have also resulted in him achieving very strong tournament results leading the general consensus to believe that Sonic is one of the best characters in the game. Sonic's highly favorable perception and continued success resulted in him being ranked 6th on the first and second iterations of the tier listand then 5th on the third tier list as he continued to perform well at most tournaments with KEN placing 2nd at 2GGC: MkLeo Saga while defeating top players such as T, Raito, Elegant, Captain L, Larry Lurr, Lima, Dabuz, Nairo and MKLeo as well as Manny, Wrath 6WX Komorikiri, Sonido, SuperGirlKels and JaKaL continuing to perform well with him. Although Sonic dropped to 7th on the fourth and current tier list and is now tied with Fox, his ranking is debatable. Some players, such as MKLeo ESAM, ANTi, ZeRo and Dabuz, believe that he should be ranked slightly higher. Conversely, Salem and others view Sonic as overrated to the point of not being a top-tier character in spite of his tournament success in the tournament, with a primary argument being his unfavorable matchup with Bayonetta. Regardless, Sonic remains a massive threat in competitive play and continues to gain consistent results. The main star of the Sonic the Hedgehog series. He's an easygoing hedgehog who blows past the competition with his speed. Seriously, on the ground he's faster than anyone else in Smash Bros. Use this to your advantage, avoiding blows while landing lightning-fast attacks. Sonic's up special Spring Jump lets him reach great heights by jumping on a spring, becoming invincible for a moment. He can't use any other specials during the jump, but he can attack or dodge. This move's great for returning from a long launch. Other fighters can use the spring, though! Sonic's Spring Jump up special lets you bounce to great heights and briefly makes you invincible at the start. You can't use other specials while in the air, but you can use normal attacks, dodge and so on. It's great for getting both back to the stage and out of tough spots, but just remember that everyone else can use the spring too! The Chaos Emeralds are said to hold enough power to control the whole world. It's that power that turns Sonic into Super Sonic. He turns a glorious golden color and can fly at nearly the speed of light. In his Final Smash, this high-speed flight damages anyone who gets in its way and can even launch them! All-Star Battle: Secret: Sonic is one of the opponents fought in this event. All of the opponents have been unlockable characters in previous Super Smash Bros. games. The FINAL Final Battle: The player must defeat Sonic, Mario, Pac-Man, and Mega Man. Up to Speed: Sonic must defeat Fox, Falco, and Captain Falcon in a high-speed, one stock battle. Full Speed Ahead: Sonic and Captain Falcon must defeat another Sonic and Captain Falcon in a high-speed, one stock battle. Sonic in the Nintendo Direct from April 8th, 2014. Sonic's confirmation image on the official site. Sonic preparing to dodge Mega Man's attack. Using his new dash attack on Link and Luigi. Using Homing Attack on Pit and Fox. Air dodging Samus' forward aerial. Using Homing Attack on Luigi. Using his forward aerial alongside Mario while Yoshi uses his back aerial. Using his back aerial alongside Mario's neutral aerial. Using Spring Jump alongside Mega Man's Rush Coil. Using his down aerial alongside Mario and Mega Man. Using neutral attack's final hit on Bowser. Using neutral attack against Mario's Fireball. Using Homing Attack against Bowser's up smash. One of Sonic's idle poses. Using neutral attack's final hit on Fox and alongside Kirby. Using his down aerial in Super Smash Bros. for Nintendo 3DS. Sonic and Wii Fit Trainer dashing after Header's soccer ball as Mega Man looks on. Sonic hitting Pit with an Ore Club. Using his down aerial to meteor smash Marth. Sonic's dash is so fast that with enough speed boosts, such as equipping all Speed-increasing equipment while using both a Bunny Hood and Superspicy Curry, he can outrun the Spirit Train. Additionally, a Sonic without customizations using Superspicy Curry dashes at the exact same speed as the water slide in the Flood Chamber of Kalos Pokémon League, which causes him to dash in place if he runs against the current. Sonic is the only third-party character to be dubbed into languages other than English and Japanese. Although he has existing 8-bit sprites from the Sonic the Hedgehog games released on the Master System and Game Gear, Pac-Man and Duck Hunt's newcomer posters depict Sonic's more recognizable 16-bit sprite from the Genesis/Mega Drive version of Sonic the Hedgehog. In Super Smash Bros. for Nintendo 3DS, there is a glitch that results in Sonic having two mouths when rolling forward or backward. This is slightly reminiscent of a similar glitch that he had as Super Sonic in Sonic Lost World. Despite being having the rest of his voice clips' replaced by ones done by Roger Craig Smith, Sonic retains Jason Griffith's clips of rising from water, sleeping, and one of his attack grunts. However, Jason Griffith is not credited for these voice clips. The European description for Sonic says "Unlike most hedgehogs, he's incredibly fast. Like most hedgehogs, however, he can't swim." The second part of this statement is incorrect; like most mammals, hedgehogs swim reasonably well. On the official Super Smash Bros. Facebook page, there is a picture for every character in SSB4, including Sonic. Sonic's was posted on December 29th, 2014 with the caption "Five gold rings", in reference to the Twelve Days of Christmas. SSB4 is the only game in the series where Sonic is a starter character. This page was last edited on April 24, 2019, at 08:50.